Please note: these checklist items will not be automatically detected. Your site’s authors will manually signal that they have completed the item. If you want to automatically check your content for compliance, please follow these instructions. A new requirement will be displayed with a blank text field where you can type the name of your requirement. To remove the custom item, just click on the Trash icon. 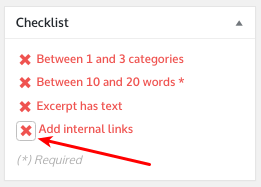 Select the respective action and after you save the options, your new requirement will be available in the checklist metabox. All custom items act like a checkbox. You can manually check or uncheck the item.